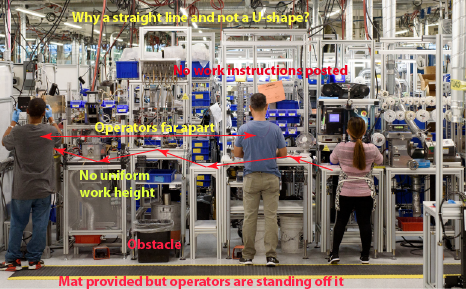 First, it’s not clear why this line should be straight rather than the standard U-shape of Lean cells, with the operator work area in the middle and the work flowing around them. The advantages of that layout are well known, including the ability to vary the number of operators with the workload and the ability to control the flow by collocated entry and exit points. Checking out details, you notice the absence of posted work instructions above the workstations and the different work heights at all the stations. Almost 100 years ago, Lillian Gilbreth came up with the idea that all work surfaces in a kitchen should be at the same height, and it became a standard feature in all modern kitchens. It makes the work easy to move between stations, which applies in manufacturing as well as in kitchens. Because standing on concrete is tiring and uncomfortable, this line has a rubber mat on the floor in front of it. It’s considerate of management to have provided it but moot, as operators are actually standing outside of it. In a Lean line, operators are supposed to move freely between stations. In this line, however, the garbage can blocks the path between the left and center operators, which suggests they are not moving. The body of the article is the usual happy talk. Lean is not all about the cumulative effect of small changes and Kaizen events. It’s not all small changes and not all Kaizen events, and Kaizen events didn’t come from Toyota anyway. It also contains statements that are just wrong, like “the vaunted Toyota Production System developed in Japan in the late 1940s…” No! Its development started earlier and is still continuing. A 2004 book by Jeffrey Liker about Toyota’s management principles. A corporate philosophy expressed in a short document distributed by Toyota to its employees. 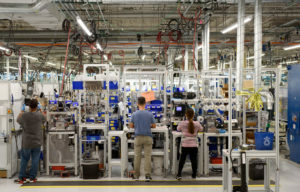 The article quotes Jim Womack saying “the frontier has been outside of the factory world for the last 20 years.” As the featured image shows, declaring mission accomplished in factories and moving on 20 years ago was premature. Jim Womack has a background in political science, not factories. It’s true that the “Lean movement” has eagerly moved away from factories. It’s not overly surprising considering that its leaders are all sociologists, anthropologists, or economists. You want factories to really perform? Then do more than say that the customer is king and rely on people’s creativity. Use coaching from experts with a background in factory engineering and management, who love the shop floor and can pass on good ideas from 70 years of TPS development. It reminds me of a picture I used to use to illustrate both improvement opportunities and the ignorance of 1) the magazine it came from 2) the company concerned. I had a similar one from a small manufacturer’s brochure: they thought piles of stock at every point illustrated what a big, productive, dynamic business they were! As for U shaped cells, yes, they may be appropriate, but I wouldn’t call them a standard. One independently-minded company got wind of these and proudly showed me what they’d done: created a U with the operators on the outside, making it easy for the material handler to feed workstations from the centre!